Published on March 11, 2014 March 12, 2014 Author Rauner LibraryLeave a comment on Novel and Extensive Machinery! Our post last week about four hours of Hamlet in French reminded us of a previous post featuring Tempest playbills. One of those deserves more attention: a breathtaking performance of Shakespeare from 1856. The Tempest! Or--The Enchanted Island! was a musical rendition of Dryden's adaptation of Shakespeare's Tempest. This version was far more popular than Shakespeare's throughout the 19th century. But this show was extra special. It was "Produced with UNRIVALLED MAGNIFICENCE" featuring 23,000 feet of moving canvas scenery. The actors were billed as coming from a "Talented Company," but the real action was behind them. A giant painted panorama scrolled across the back of the stage as the play progressed, showing views of the Prospero's cave by moonlight, the yellow sands, and the coast of the enchanted island with the storm-driven ship. It all ended with a Tableau and Finale by Ariel and the Sprites. 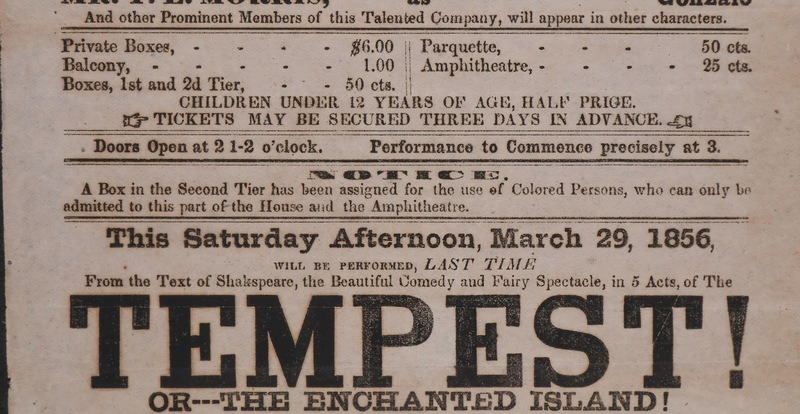 Sobering are the ticket details: a hefty $6.00 for a private box, $1.00 for the balcony, and $.50 for the Second Tier box "assigned for the use of Colored Persons."